Aug. 6, 2012 - PRLog -- On July 16, our iFOGO.com staff learned of The Grio’s selection of Gene Cartwright as the winner of its maiden essay contest. Most of us had no idea he had entered. Self-focus and self-congratulations are just not his style. We, his friends and associates, are happy to carry that mantle. And so we proudly herald our iFOGO.com founder, Texas native and California resident, Gene Cartwright’s talents as a writer. The Grio has discovered what we, and what the legion of readers of his masterfully written novels, already know. While the flag means different thing to different people, we can all surely agree that the history it represents can only be understood if all are willing to acknowledge the truth. One can be a patriot and yet not whitewash those failings that should be corrected. To demand less, is to fail the true test of patriotism. Few questions are more thought-provoking. For many, the flag is a symbol of freedom valiantly earned; for hope eternally lifted to the world; and inspiration that endures. 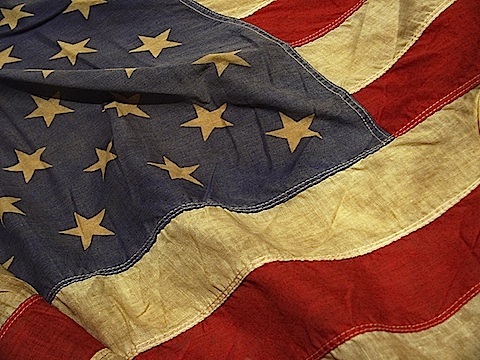 When I see the American flag, I see more than “Old Glory Red,” “Old Glory Blue,” and brilliant white. I see more than precisely sized and spaced stars and stripes—the whole of it waving proudly. No, for me, that is an idealized view that is but a symbol of another American flag even more majestic, and awe-inspiring.